Summer Solstice at Stonehenge. From Past to Present. Although there was historically a Summer Fayre at Stonehenge held on traditional midsummer’s day of the 24th of June, it was only comparatively recently that the association between Stonehenge and the Summer Solstice Sunrise was realised. Before Britain adopted the Gregorian calendar in 1752, the summer solstice had slipped out of sync with the old Julian calendar by 11 days. This meant that the Sun didn’t appear to rise from the Heelstone on 24th June. People somehow knew that they should be at Stonehenge on “midsummer’s day”, but the reason had long been forgotten. Indeed, it was only in 1771 that the first link between the Heelstone and the Summer Solstice Sunrise was mentioned by Dr. John Smith, even though William Stukeley had identified that the Avenue lead off towards the solstice sunrise point some 30 years earlier. Smith churlishly didn’t even acknowledge Stukeley’s work in his book. These days, of course, everyone knows about it. From about 3pm on the 20th June, Stonehenge closes to regular visitors in order for preparations to begin for the largest mass pilgrimage to a solar temple in modern times. Up to 40,000 people begin arriving across the landscape on foot, or by car and coach to the fields by the Visitor Centre (parking charges are £5 per motorbike, £15 per car, live-in vehicle or minibus up to 19 seats, £100 per coach with coach-space pre-booking essential, and there is no discount for disabled badge holders) in advance of the monument being reopened at 7pm. This is the one time in the year when anyone can spend the night inside the stone circle, and it gets crowded very quickly with travellers, drummers, pagans, druids, cosplay wizards and faeries, as well as more “ordinary” folk. Alcohol has been banned in recent years but evidence is obvious of prior indulgence in that and other recreational substances amongst the revellers. This “managed open access” has the feeling of a massive outdoor party rather than a respectful observance but most people seem to have a good time. The locals tend to come for the evening on the 20th before escaping ahead of full nightfall, and the atmosphere is more family-friendly between 7pm and sunset around 9.30pm. 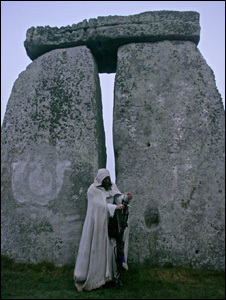 Ahead of sunset a number of groups tend to perform “all welcome” ceremonies in the centre of the circle, including the modern Druids usually led by Archdruid Rollo Maughling, King Arthur Pendragon or Merlin of England. As night falls the entire field around the monument fills up and people gather in groups on and under blankets (no sleeping bags permitted) and while away the hours until the much-anticipated solstice dawn on the 21st. A number of concession stands near the field entrance serve up tea, coffee and a variety of food to keep everyone warm, and there are first aiders, security marshalls, volunteer peace stewards and a low-key police presence to ensure everyone’s safety. Portaloos are installed all around the site as well as lighting gantries which are gradually dimmed as dawn approaches. Bags are security checked at the entrances to the field to intercept glass bottles or other dangerous items, and no animals are allowed apart from the drugs sniffer dogs on the gate. The “managed open access” at summer solstice has been in place since 2000 and I have attended all bar two of them. In 15 years, I’ve seen a clear solstice sunrise only twice – so if you plan to come, be prepared for a cloudy morning with no sight of the Sun. Bring waterproofs and wear many layers – it can be unexpectedly cold at 2am in the middle of a field in Wiltshire, and it frequently rains (on occasion very, very heavily) overnight. Umbrellas are forbidden but a black plastic binbag makes an acceptable, if unfashionable, substitute. Dawn occurs at 4.52 BST, but the Sun is always a few minutes late because the trees on the horizon to the northeast delay its appearance. As the centre of the circle is by now absolutely rammed solid, the Druid ceremony usually takes place by the Heelstone after sunrise. The monument field has to be cleared by 8am so that the site can be tidied up and put back to normal in time for it to re-open to regular visitors by about 3pm on the 21st. The attendees drift away back towards the car park and peace, of a sort, descends. Now the real work begins for the on-site Historic Property Stewards who care for the monument all year round, and the army of temporary contractors. The grass in the centre of the circle is “groomed” with rakes having been trampled flat by thousands of feet for 13 hours and the whole area of the monument within the henge bank and ditch perimeter is litter-picked on hands and knees. Lost property is gathered together in case the owners come back for it – though how anyone can forget a baby buggy is hard to imagine. The visitor barrier ropes are re-installed around the circle, the interpretation panels are re-erected, the bench seats on the path are returned and the overnight infrastructure is taken away, along with several tons of rubbish. Sprinklers are deployed to revivify the turf. The Stonehenge Summer Solstice experience is unlike any other – for some people it’s a lifetime’s ambition, for others it’s an excuse for a party. For Stonehenge, this year will be something like the 4,517th time it’s seen people gather at this turning point in the seasonal round – it must have some stories to tell, and Stone 28 is probably the one to tell them – you just have to listen closely. If you are considering visiting Stonehenge for the Solstice or Equinox celebrations you can join an organised tour and save all the hassle. Use a reputable tour operator who respect the conditions. Stonehenge Guided Tours are the longest established company and Solstice Events offer small group Solstice tours using only local expert guides. Stonehenge Summer Solstice Open Access Arrangements. Follow @St0nehenge @EH_Stonehenge @VisitStonehenge @HighwaysEngland and @Wiltshirepolice for #summersolstice updates on the night. English Heritage will once again welcome people to Stonehenge to celebrate the Winter Solstice. Sunrise is just after 8am on Monday 22nd December and visitors will be able to access the monument as soon as it is light enough to do so safely. Conditions of entry will be posted shortly. Please be aware that parking is very limited and there is a thirty minute walk, in low light, from the parking areas to the monument. The solstice is traditionally celebrated at the sunrise closest to the time when the sun is stationary before beginning its transit to the north or south. This year this occurs late on 21 December, hence the winter solstice celebrations take place at sunrise on 22nd December. climbing on them can damage the delicate lichens. If do not have your own transport and are travelling from London then Solstice UK Events are offering their usual transport option with an expert guide. **Stonehenge is a world renowned historic Monument and seen by many as a sacred site – please respect it and please respect each other!